I remember being in college, which was quite a long time ago, and sitting in the common room with my friends and one of the girls we hung around with who was a complete sweetheart but so vain bless her pulled out a tub of Clinique day anti-wrinkle cream and started applying it. All of us sat around dumbfounded that she could have the gall to start applying anti-wrinkle cream when we were all only in our late teens and laughing at our opened mouths my friend said something that always sticks out in my mind every time I go wandering down the anti-ageing aisle of Boots – it’s never too early to start looking after your skin. Now in my mid-twenties and an avid follower of all things beauty-blogging I’ve developed a small fascination with anti-ageing lotions and potions. I don’t get where to start, what I should be using, what may be too much and how much I can typically spend without feeling that I’ve bankrupted myself. I generally don’t believe in shelling out loads of money for some miracle cream and I can barely part with anything over a tenner for a bit of make-up so I’ve decided to settle for the next best thing: a cheap as chips daily skincare routine. No lie, I am awful at following this routine every day and this weekend I’ve taken my make up off with wet wipes but when I do get into the swing of doing this daily it really helps keep my face looking and feeling fresh without spending the big bucks. I know this is a ‘simple’ skincare routine but that doesn’t mean that everything I use has to be in the Simple range. When I was looking at investing a little money into toner and moisturiser I decided to chuck this big bottle of micellar water in with the lot as well and it’s been quite possibly the best buying decision I’ve made in a long time. If you’re frugal with your make up like me then you need to buy this bottle. 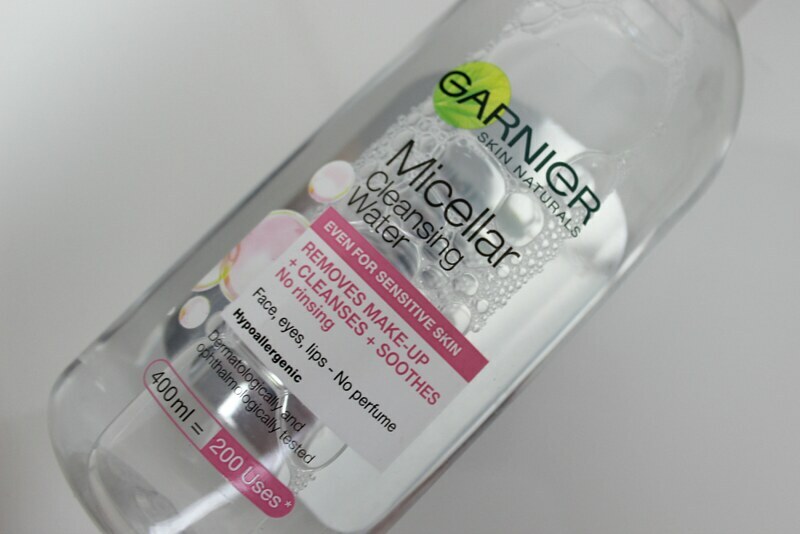 The Garnier Micellar Cleansing Water 300ML is only £3 and goes on, and on, and on. I’ve had this bottle going since before last year and it’s such a gentle product to use for removing eye make up especially. I remember when this first came out and everyone was blogging about it and, like usual, I sat back thinking ‘yeah right!’ but I’ve been steadily impressed the more I use this and it fits so well into my routine because it’s not aggressive with my skin at all. When it comes to the skincare upkeep and not just makeup removal generally I use Simple as my go-to. 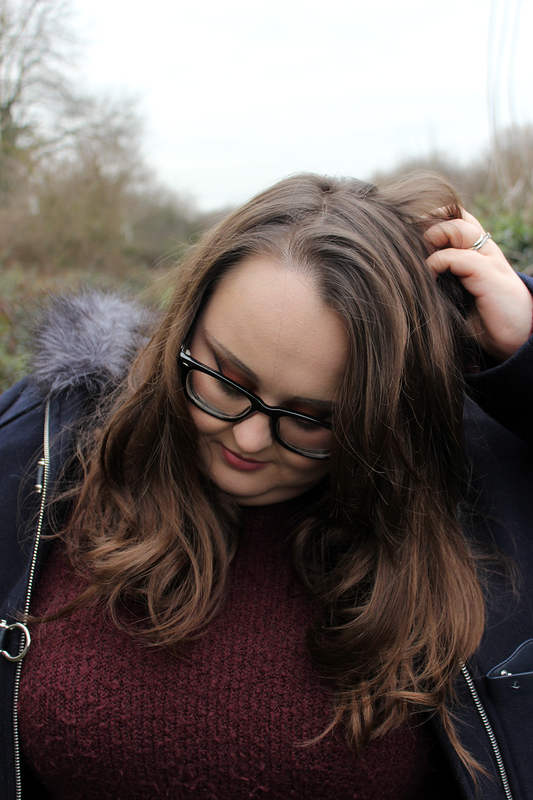 They are a brand that are very insistent on using only the essential ingredients and nothing else that can cause issue with sensitive skin and that’s something I’m a huge fan of! I also find these products to be very purse-friendly because they don’t cost the Earth to replace, probably under a fiver each if I run out and there’s usually an offer on at the time. 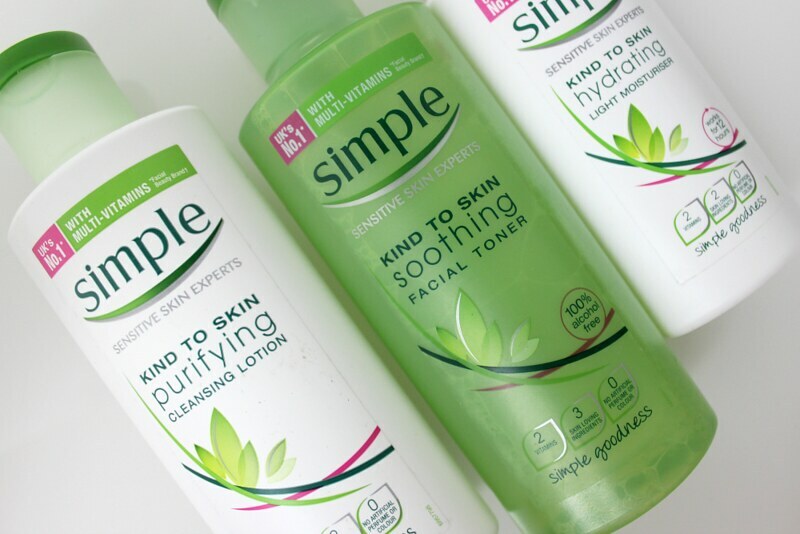 I tend to the same three combination of Simple Kind To Skin Purifying Cleansing Lotion, Simple Kind To Skin Soothing Facial Toner and the Simple Kind To Skin Hydrating Light Moisturiser. I follow the usual routine with the order that I apply these products and I find them to be a nice little introduction into the world of cleansing and toning without feeling like you’ve jumped right into the deep end and feel like you’ve drained your bank account just for the experience. Bonus: the moisturiser smells like ready salted Pringles to me. The only product from this line-up that I don’t have a close up of is the Simple Kind To Skin Soothing Facial Scrub. I don’t use this daily but only every once in a while if I’m suffering from a break-out of spots or my face feels especially greasy. I have issues with my hormones anyway so I don’t expect a product to work miracles on my face when my skin can’t decide what combination of anything it wants to be but this facial scrub does a fantastic job at making my face feel like it’s had a deep clean whenever I use it. Do you have a go-to product of range for skincare? What’s your routine and your experiences of trying new things been like? Let me know in the comments.